APRIL 4, 11:18am: The Sixers have officially signed Monroe, according to a press release from the club. The team’s roster is now back to 15 players. APRIL 3, 4:10pm: The Sixers have officially waived Patton, the team announced today in a press release. APRIL 3, 12:49pm: Philadelphia will be the next stop for Greg Monroe, tweets Jordan Schultz of ESPN, who states that the Sixers will waive center Justin Patton tomorrow and sign Monroe for the rest of the season. Monroe became available when his 10-day contract with the Celtics expired last night. Boston passed on an opportunity to re-sign him, preferring to keep a roster spot open for other options. The 10-day contract won’t prevent him from being eligible for the playoffs, notes Keith Smith of Yahoo Sports (Twitter link). Only players waived since March 1 lose their postseason eligibility, and Monroe hasn’t been waived — his 10-day deal with Boston simply expired. Monroe will provide a veteran presence in the middle for the Sixers, who have been seeking backup help at center. Philadelphia will be his fourth stop of the season after beginning in Toronto before being traded to Brooklyn and then waived. He averaged 4.8 PPG and 4.1 RPG in 38 games with the Raptors, but played just five total minutes in two games with the Celtics. Philadelphia won’t be on the hook for much salary with Patton, who is entering the final week of a $2,667,600 contract. Injury problems have limited him to just four games in two NBA seasons after being selected with the 16th pick in the 2017 draft. His 2019/20 option was declined by Minnesota last fall. The Celtics will part with veteran center Greg Monroe, whose 10-day contract expired Tuesday night, tweets Mark Murphy of The Boston Herald. Monroe got into two games during his return to Boston and played just five total minutes. He was signed to provide insurance for the front court after a wave of injuries to Al Horford, Aron Baynes and Robert Williams. This marks the second trip to the waiver wire this season for Monroe, who was released by the Nets in February after being acquired from the Raptors in a deadline deal. He was a playoff contributor for the Celtics after signing with the team in February of last season, but never got close to that level this time around. Boston will likely fill its open roster spot before the regular season ends next week, but a source tells Murphy that a move isn’t expected today. Thomas Robinson played well after joining the organization’s G League affiliate in Maine and was considered for the opening before the Celtics opted for Monroe. Greg Monroe is ready to contribute right away after signing a 10-day contract with the Celtics earlier today, relays Taylor Snow of NBA.com. The deal was finalized this afternoon after being first reported Friday and delayed amid rumors that Boston wanted to give the final roster spot to Thomas Robinson. An injury to Robert Williams last night, with Al Horford and Aron Baynes already sidelined, may have convinced the Celtics to add another center. The 28-year-old spent the first part of this season in Toronto, but has been out of the NBA since being acquired and then waived by the Nets at the trade deadline. Monroe hopes to help out the Celtics the way he did last year when he averaged 10.2 PPG and 6.3 RPG after joining the team in February. The Sixers‘ blockbuster trades could backfire if they can’t keep the starting five together after this season, warns Keith Pompey of The Philadelphia Inquirer. The front office will likely have to give max deals to both Jimmy Butler and Tobias Harris, and J.J. Redick will be a free agent as well. March 24: The Celtics have officially signed Monroe to his 10-day deal, the team announced on social media. There was some uncertainty over whether Monroe would ultimately be signed, but the team went forward with the agreement on Sunday. March 22: Veteran center Greg Monroe has agreed to a 10-day contract with the Celtics, Shams Charania of The Athletic tweets. Boston has an open roster spot, so the team won’t have to clear a space for the new addition. Monroe provides some depth in the middle with the team’s top two big men, Al Horford and Aron Baynes, nursing injuries. Horford is dealing with left knee soreness, while Baynes is battling an ankle sprain. Neither will play against Charlotte on Saturday. Appearing in 38 games with the Raptors this season, including two starts, Monroe averaged 4.8 PPG and 4.1 RPG in 11.1 MPG. Toronto traded him to the Nets just before the February deadline and Brooklyn immediately waived him. He has been shopping for another opportunity since that point. Monroe, 28, will be entering his second stint in a Boston uniform. He played 26 regular-season and 11 postseason games with the Celtics last year. The Celtics could eventually sign former NBA forward Thomas Robinson as their 15th man, but they want him to play out the G League season with their affiliate, Keith Smith of RealGM tweets. Robinson was claimed by the Maine Red Claws team last week. Boston also had an imminent need at center, which made Monroe a logical choice. Despite a report that surfaced last night, the Celtics may be having second thoughts about signing veteran center Greg Monroe to a 10-day contract, tweets Keith Smith of Yahoo Sports. Aron Baynes‘ ankle injury may not be as serious as originally believed, which would reduce the need to add another center. Coach Brad Stevens said Baynes, who was diagnosed with a Grade 2 sprain on Wednesday, may be available for tomorrow’s game with San Antonio (Twitter link from A. Sherrod Blakely of NBC Sports Boston). Thomas Robinson, who joined the Celtics’ G League affiliate in Maine this week, is also being considered for the open roster spot, Smith adds (Twitter link). Robinson has averaged 14 PPG and 14 RPG in his first three games for the Red Claws, who will end their season tonight. Smith describes the competition to fill the 15th spot in Boston as “fluid” and says some believe Robinson has the inside track. The fifth player selected in the 2012 draft, Robinson spent the season in China before coming to the G League. The 28-year-old joined the Hawks for training camp last fall, but hasn’t played in the NBA since the 2016/17 season. As Brian Lewis points out for The New York Post, Nets GM Sean Marks didn’t offer D’Angelo Russell a contract extension in October mainly because he wanted to see if the young point guard could prove himself to be a go-to option and leader. So far, so good on that end as Russell has stayed healthy this season and is averaging career highs of 20.3 points and 6.6 assists per game going into his first All-Star game appearance. Russell has been the leading force on a Nets team that is surpassing expectations, having already won more games (30) than they did all of last season (28). Russell’s improvements have coincided with steady improvement from Joe Harris, Jarrett Allen, and Spencer Dinwiddie, with veterans and rookies contributing in other spots as well. The Nets will now look to build on their strong record and claim their first playoff spot since 2015, as Russell will look to lead the way and play his way into a big contract this summer. Although Dzanan Musa‘s rookie season has been impacted by several injuries, his agent expressed that the Nets have been pleased with his development, as NetsDaily reported earlier this week. Amidst a strong rookie season, Rodions Kurucs spoke about how his game and style of play differs from that of his fellow Latvian Kristaps Porzingis, as Marc Berman detailed for The New York Post. In a recent New York Notes post, we explored how Marks viewed the Nets’ trade deadline in which they acquired (and then subsequently waived) Greg Monroe, as well as how it impacted their roster. 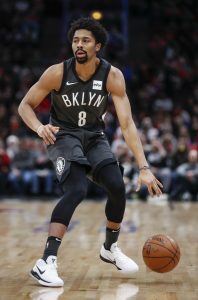 Dinwiddie has been one of the biggest bargains in the league over the past couple of years but he figures to get a hefty pay raise next summer. Dinwiddie may not be the prototypical point guard but he can carry an offense at times. He’s averaging 14.9 PPG while shooting 48.9% overall and 43.5% from long range. He’s a career 32.5% 3-point shooter, so if he can establish himself as a solid long-range threat, he’ll be even more valuable. He had a 25-point outburst, all after halftime, and made the game-winning shot against his former team, the Pistons, on Wednesday. Dotson has a non-guaranteed salary next season. It’s hard to see the Knicks cutting a productive player on a dirt-cheap deal loose unless they hit the jackpot on a couple of top level free agents and need to open up more cap space. Dotson, a second-round pick last summer, has taken advantage of an injury to rookie Kevin Knox, scoring in double digits in each of the last six games. He’s also been a factor on the boards, averaging nearly six per game. Dotson has earned coach David Fizdale’s trust, though it will be interesting to see how much his minutes drop when Knox returns. The Sixers were hoping that Chandler would be a key component of their second unit. They’re still waiting to see if that’s the case, as Chandler has yet to make his Philadelphia debut due to a hamstring injury. Chandler has been durable in recent seasons, appearing in at least 71 games for the Nuggets the past three seasons, but he’s at the point of his career where injuries could be a growing concern. Brad Stevens has a lot of quality pieces to fit but Morris doesn’t need to worry about his rotation spot. He’s posting averages of 14.4 PPG and 7.4 RPG in 25.6 MPG off the bench while guarding three different positions. Those stats are even more impressive on a loaded team with a lot of mouths to feed. Morris is due for a huge pay increase after signing a team-friendly deal with the Suns three years ago. Monroe is the type of player who’s getting phased out of the league. He’s a low-post scorer with slow feet who has difficulty making defensive switches. He’s made only two brief appearances with the Raptors thus far and will likely remain at the end of the bench unless injuries pile up. Monroe will likely have to settle for a similar contract in free agency next summer.